NEW YORK — It took just eight days for Refco Inc. to go from up-and-comer to down-and-out, with a midnight bankruptcy announcement capping off the commodities broker’s stunning collapse. The new owner of its commodities trading subsidiary, however, believes the company now has a chance to right itself and return to its former glory as the nation’s largest independent commodities trader. 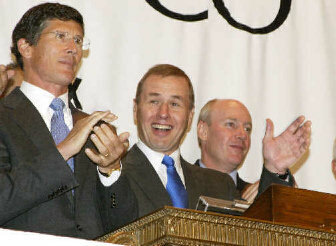 A consortium of private buyout firms, led by J.C. Flowers & Co. LLP, tentatively agreed late Monday to purchase Refco’s commodities trading subsidiary for $768 million, salvaging one of the few solvent divisions in the company. Refco and 23 of its subsidiaries then filed for Chapter 11 protection in U.S. Bankruptcy Court in Manhattan. The head of the consortium, J.C. Flowers Chairman Christopher Flowers, said he hopes to rescue all of Refco, which tumbled ignominiously into bankruptcy after the company revealed Oct. 10 that former Chief Executive Phillip Bennett hid $430 million in bad debt from regulators and shareholders. “Part of Refco’s appeal is its independence,” Flowers said in an interview with The Associated Press. Refco shareholders are likely less sanguine. After being delisted Tuesday from the New York Stock Exchange, shares of Refco were trading at just 65 cents each on the “Pink Sheets” electronic bulletin board — a 98 percent tumble from its closing price on Oct. 7, the last trading day before the accounting scandal came to light. Since then, Bennett has been arrested on federal securities fraud charges, and customers abandoned Refco in droves, precipitating a cash crunch that led to the bankruptcy filing.